Let me start by saying that ten days in this magnificent island country is too less to be able to fully experience it, but I have tried my best to squeeze in a lot of things and still be able to visit a lot of places in Japan. Japan is quite expensive compared to other Asian nations, but on par with the European countries or U.S.
Japanese being the national language, you will find street signs in English as well, but not everyone speaks English. Except for main cities like Tokyo, Kyoto or Osaka, most locals speak Japanese only. So make sure to ask your hotel concierge to write directions, addresses, names etc. on paper and carry it with you at all times. You will experience the most humble, helpful and friendly people in the whole world in Japan. Locals will go out of their way to help you and are courteous enough not to get annoyed by that. The humbleness of Japanese people is one of the experiences any traveler must have in their lifetime. I required a visa prior to visiting Japan, and with the usual list of documentation required to get a visa – flight tickets, hotel bookings, itinerary, bank statements, passport copies, etc. – I headed to the Japanese Consulate and upon a quick interview I got a dual-entry visa for the duration of the trip only. Japan’s currency is Yen. There is no subdivision of the Yen. The abbreviation JPY or ¥ is used everywhere and the exchange rate was USD 1 = ISK 100 at the time of the trip. You will also see the sign ‘円’ used across Japan to indicate prices. On time! – Japanese are known for their punctuality and they ensure to keep it that way. So if you’re late for bus timings or stores or anywhere, you will miss that opportunity even if you’re a minute late. Taxis – Taxi drivers are abundant in cities, but less in rural areas. They are co-operative, patient and helpful when you don’t speak the language. As a traveler, it’s best to carry a paper with addresses and names of places you’re visiting written on it. This helps the taxi drivers to navigate easily. Taxis are not cheap in Japan, because of the abundant public transportation alternatives. So unless you don’t know your way around, do not take a taxi if you’re on a budget. Buses – Government-operated public buses are everywhere in Japan – that run long distances and within a town/city. Along with that, various private companies operate buses and trains. Make sure to check what buses cover what area and whether they are a part of the Japan Rail Pass (see below). In case if you have a JR Pass, then those bus rides are free! Else you can purchase bus tickets at kiosks placed at main bus stations. Most bus companies have day-passes that are cheaper than single ride ones but only if you’re planning to take the bus for multiple rides. Hotels are abundant in Japan and have smaller rooms compared to other cities for the cost you are paying. As I mentioned, Japan is expensive so don’t expect cheaper and bigger rooms. It can get busy in main cities so book in advance. Booking.com has some great budget hotels in the city center, that has last minute cancellations, in case if you have to. Tap water is safe to drink in Japan. Wi-fi – Available in all hotels, restaurants, and businesses, although not unsecured. Mobile services – This one gets a bit tricky. After reading some reviews online, I decided on b-mobile’s Visitor SIM card. For ¥3,980 you get 1GB of data that can be used for 14 days (whichever comes first). After 1GB you need to walk to a b-mobile store or go online to recharge. The tricky part is that you can either pick up the SIM from a b-mobile store at Narita airport or they deliver it to your hotel. Now the problem is the time we were reaching NRT, the store would be closed, so the only option for me was to pick it up from the hotel. You need to be able to let your hotel know about the delivery so they can save it for you. This means that if you are staying in a hostel or Airbnb’ing you stay then it’s not possible to have it delivered. Fujita Kanko announced its hotels will be selling BIGLOBE Ninja SIM prepaid cards. Ninja SIM cards come in two sizes, nano SIM and micro SIM, and three capacities: 1GB, 3GB and 7GB, costing ¥2,700, ¥4,500 and ¥7,300 yen respectively, including tax. The cards are valid for 30 days. The 3G/4G/LTE service was awesome across the country. This is the most important part of your planning. Get a Japan Rail pass if you plan to travel around the country. You can visit the Japanese consulate or JR offices in your city to purchase one. JR passes can be bought online as well. 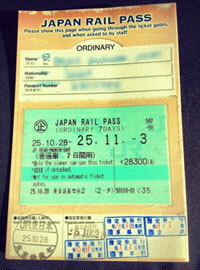 Remember JR pass can be only bought outside of Japan and must be bought before you enter Japan. They come in three types – 7 day, 14 day or 21 day pass. Starting at US$280 for a 7-day coach class pass, this is one of the best investment you will make for your Japan trip. It covers all the Shinkansen’s (bullet trains), local buses that accept JR passes, and JR suburban train lines. All you have to do is show your pass and you travel free! Your number of days period starts from your first travel. Go to the JR Pass office at Tokyo station and exchange your ticket (given to you when you purchase it) for an actual JR Pass. You can mention the starting date to the desk personnel. Keep this pass with you in the same way you’d keep your passport, but more handy. The pass is valid on almost all trains operated on the nationwide network of JR (Japan Railways), including shinkansen, limited express, express, rapid and local trains. Pass holders are allowed to get on and off only at Aomori, Hachinohe and Noheji Stations. This allows pass holder to access the Shimokita Peninsula. Flight from LAX to NRT $888.90 Via Malaysian Airlines. Return cost.